Florida is commonly considered the vacation capital of the United States. As the ice and snow covers the Northeast and Midwest, old and young alike, seek refuge in the Sunshine State. Baseball has a rich history in Florida for similar reasons. It should be no surprise that College Baseball has found success on America’s southern peninsula. Florida has quickly become the state producing the most per capita MLB draft picks than any state in the nation. This allows College Baseball programs in the state of Florida to stock their rosters full of many of the state’s most talented young ballplayers. In the 2018 NCAA Baseball Tournament the Florida (Gators), Florida State (Seminoles) and Stetson (Hatters) all hosted Regionals on their respective campuses. Stetson would advance to the Super Regional, while the Gators would return to Omaha for the fourth consecutive season. The UF baseball program has emerged as one of the preeminent powers in all of College Baseball. As mentioned, the Gators have advanced to Omaha in four consecutive seasons (and 10 of the last 16 seasons), appearing in three National Championships and finally capturing the national title in 2017. The Gators have done it with dominant pitchers, many of whom were MLB First Round Draft Picks. Alex Faedo (2017 #18 Overall, Detroit), Brady Singer (2018 #18 Overall, Kansas City) and Jackson Kowar (#33 Overall, Kansas City) all helped lead those Gator teams. Throw in Third Baseman Jonanthan India (2018 #5 Overall, Cincinnati) and the Gators teams of the last several years have been producing some of MLB’s most desired prospects. Florida enters 2019 in a strong position once again; ranked as Preseason #6 in D1 Baseball Poll, # 4 in Baseball America Poll and #3 in the Coaches Poll. After so many top UF pitchers have been drafted in the last two years, Head Coach Kevin O’Sullivan looks to continue his squads string of CWS appearances with another set of experienced arms in RHP Tyler Dyson Jr., Jack Leftwich and Tommy Mace. Sophomore OF Wil Dalton Jr. provides the offensive power; he posted 19 HRs and 60 RBIs in 2018. As the Gators march toward Omaha in 2019, they have also broken ground on a new ballpark, set to open for the 2021 season. In many ways, the Seminoles and Hurricanes enter 2019 at the opposite ends of the spectrum. Florida State comes in ranked #13 in the D1 Baseball Poll, #6 in the Baseball America Poll and #3 in the Coaches Poll. 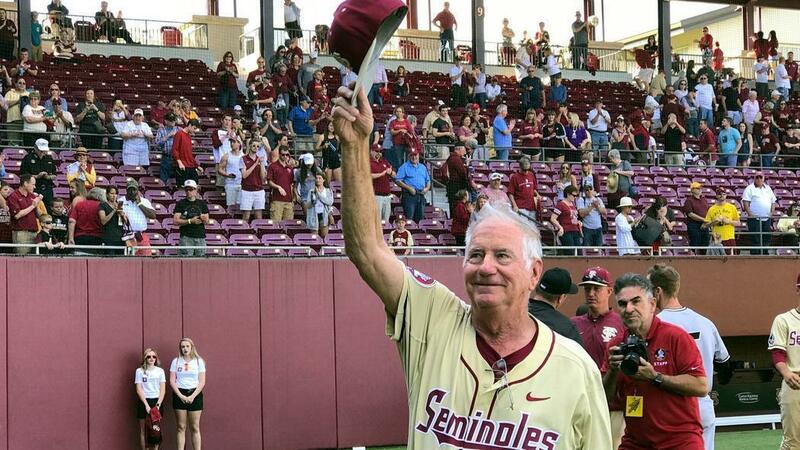 Most notably, the 2019 season marks the end of the Mike Martin era in Tallahassee. Martin enters his 40th season as Head Coach of the Noles, becoming the winningest College Baseball coach of all-time (in 2018) with his 1,987-711-4 record. His Seminoles have won 8 ACC titles, appeared in 16 College World Series and been runner-up to the National Championship twice (1988,1999). He coached many who would become top MLB talents, like Buster Posey and JD Drew. Yet, with all the program’s success, they have not secured a national title. Pitchers Drew Parrish (128 Ks in 2018) and CJ Van Eyk lead the rotation, while Third Baseman Drew Mendoza looks to continue his clutch hitting into 2019. Meanwhile, down in Miami, the Hurricanes are rebuilding. In 2017, UM missed the NCAA tournament for the first time in 44 seasons. Their 28-26 finish in 2018 excluded them once again. Head Coach Gino DiMare is a product of Canes baseball — first as a player under Ron Fraser and then as an Assistant Coach, under Jim Morris. Restoring the Miami program is a big task, as the Hurricanes have historically been among the very elite clubs in all of College Baseball; 25 CWS appearances and four National Championships (1982, 1985, 1999, 2001). The Canes are said to have a strong incoming Freshman class and fall just outside the Top 25 in preseason rankings. While the Gators, Noles and Canes might grab a majority of the College Baseball headlines, the state runs deep with baseball talent and emerging programs. After all, Stetson found themselves hosting a Regional in 2018 and their Ace, Logan Gilbert, was selected #14 Overall in the MLB Draft by the Seattle Mariners. Stetson knows something about producing Pitchers. 2018 NL Cy Young Award winner Jacob deGrom and two-time AL Cy Young Award winner Corey Kluber are Hatters alum. They will have competition this season in the Atlantic Sun, with Jacksonville and Florida Gulf Coast on their tail. In the American Athletic, UCF has a strong returning lineup and fell just short of the tournament last year. They host an important early season series against Auburn beginning February 22. USF may have some challenges, losing top pitcher Shane McClanahann (#31 Overall) to Tampa Bay in the 2018 MLB Draft. Both FIU and FAU could make some noise out of Conference USA. Florida International’s Third Baseman, Austin Shenton Jr., ranks among the best prospects in all of College Baseball. As pitchers and catchers report to their Spring Training locations this week, the baseball season is upon us in the Sunshine State. Next weekend, Florida hosts Long Beach State, FSU hosts Maine, Rutgers heads to Miami and the road to Omaha begins.